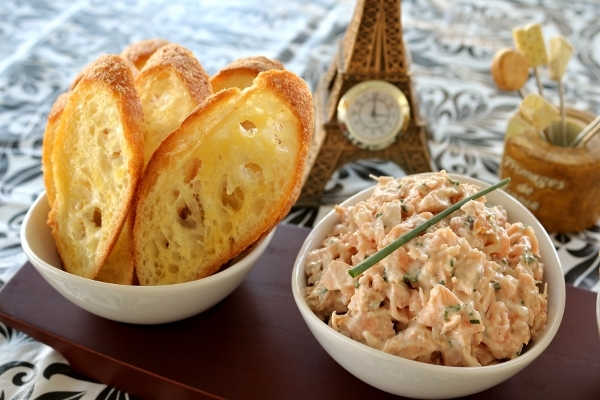 I've already shared the Pumpkin Beignets dessert recipe from a recent French meal I cooked, but let's back track to the first course: Salmon Rillettes. I first had the pleasure of enjoying this dish during lunch at Le Bernardin in New York City. This three Michelin starred restaurant only serves this popular spread at lunch service with toasted baguette slices. I've dined at Le Bernardin twice for lunch, and both times swooned over this spread, even before being wooed by the rest of the meal, and of course visiting the kitchen to meet Eric Ripert himself. Dreams really do come true, folks! 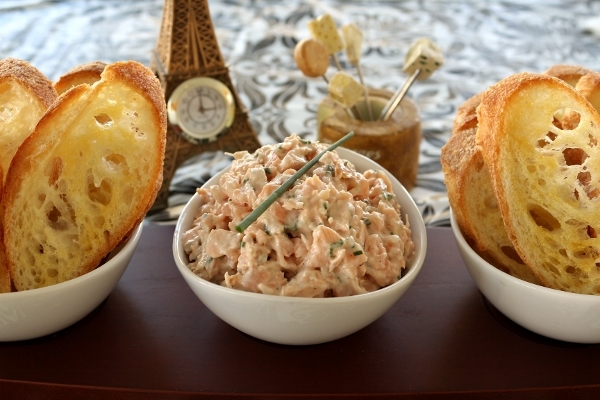 Ripert's Salmon Rillettes recipe can be found in his Avec Eric cookbook, which I happily own. Considering it comes from one of the best chefs in the world, and one of the best restaurants anywhere, this dish is so straightforward and easy to prepare! The key is to use really good ingredients and not to over dress or over season it. This rillettes is a revelation. It starts with pieces of salmon gently poached in wine wine with minced shallots. 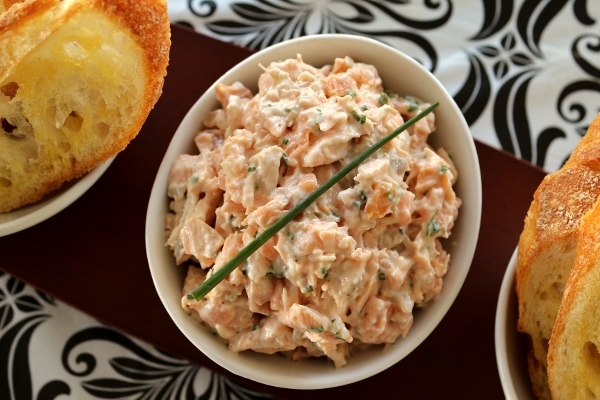 After it cools, it joins diced smoked salmon and a light dressing of mayonnaise, lemon juice, salt, pepper, and chives. That's pretty much it! It sounds so simple (and it is) but it comes together perfectly. It's served with thin toasted baguette slices in the restaurant, and I replicated this myself by using a good quality baguette from a local bakery, thinly slicing it on the bias, very lightly brushing with olive oil on one side and toasting it in the oven for a few minutes just until crisp. 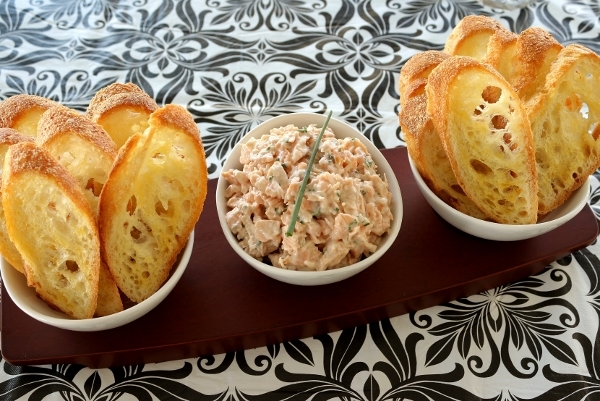 This rillettes would make an excellent starter to any meal, French, seafood-based, or otherwise. 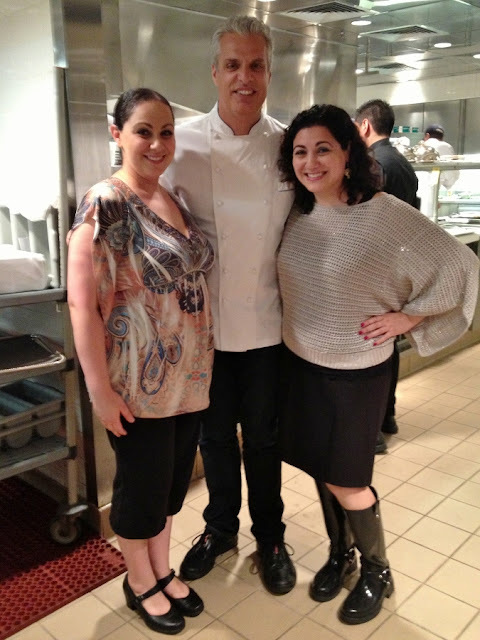 Your guests will never know how easy it is to prepare (guests at Le Bernardin never guess either!). It's a far easier way to enjoy some of the gourmet bites at one of the world's best restaurants from the comfort of your own kitchen. Combine the white wine and shallots in a large saucepan and bring to a boil. Simmer over medium-low heat until the shallots are tender, about 2 minutes. Add the salmon pieces and poach until they are just barely opaque, about 2 to 3 minutes. Remove the salmon pieces from the wine and immediately drain them on a baking sheet lined with a paper towel. Strain the wine, reserving the shallots. Place the salmon and shallots in the refrigerator to cool completely. 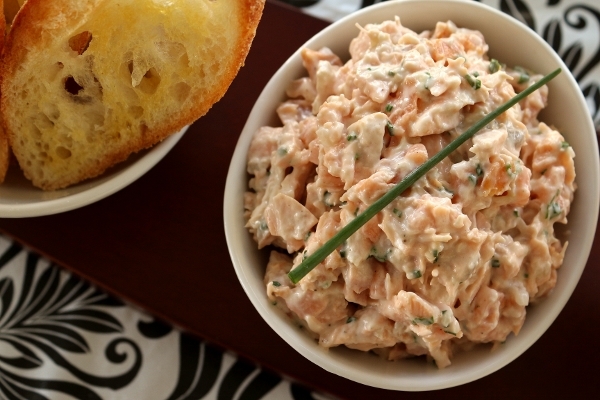 Combine the poached salmon pieces, reserved cooked shallots, smoked salmon, chives, and some of the mayonnaise and lemon juice in a stainless steel bowl. Use the mayonnaise and lemon juice sparingly, so that just enough is added to moisten the mixture. Gently stir the mixture until thoroughly combined; the salmon will break up a little--do not over-mix or mix too hard or it will become a paste. Season the rillettes with salt and pepper. 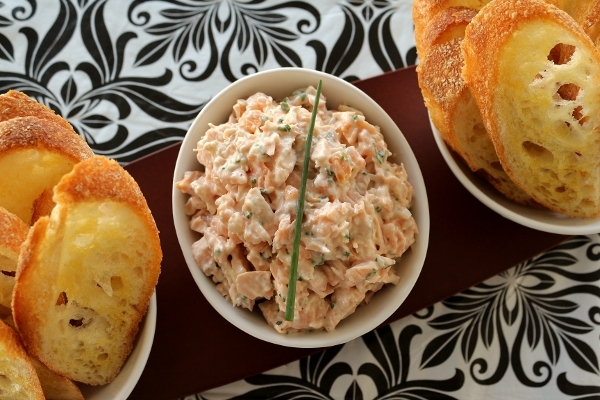 Serve cold with toasted baguette slices. Rillettes can be made 1 day in advance and covered and chilled until needed.